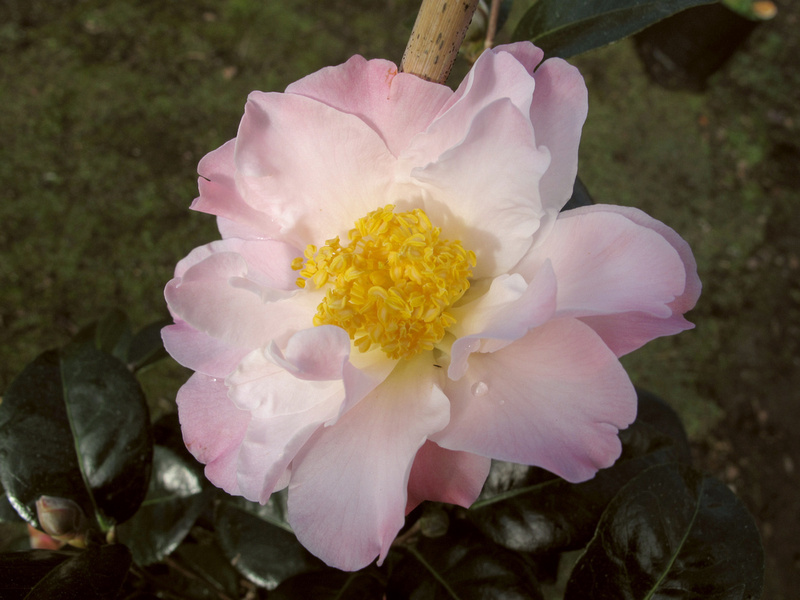 With three New Zealand Jurys breeding camellias over a period of some fifty years, it is not always easy for the outsider to know which cultivars belong with which Jury. 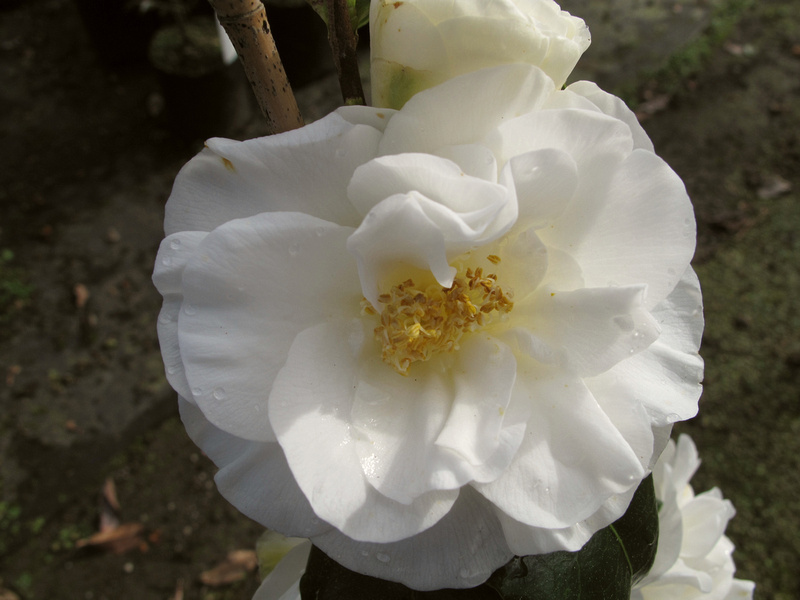 It was Felix Jury’s older brother Les Jury who started breeding camellias and who had many released internationally through his relationship with Duncan and Davies Nurseries. Les was responsible for such classics as Elegant Beauty, Rendezvous, Jury’s Yellow, Debbie, Grand Jury, Elsie Jury and his last cultivar which was named for him, the lovely red “Les Jury”. 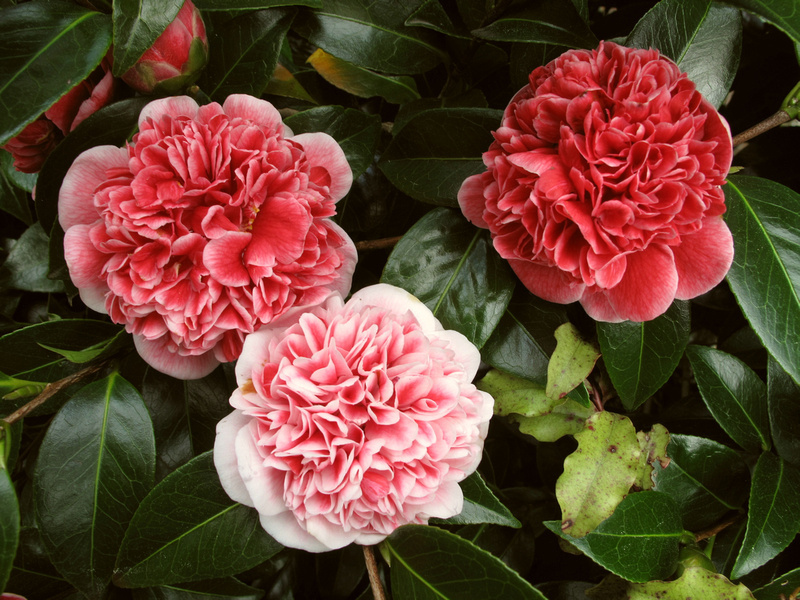 Camellias are more driven by fashion than plants such as the magnolias so some varieties do not stand the test of time and drop out of cultivation as the tastes of the buying public change. In general terms, Les was breeding for large, self grooming flowers on good bushes but he was also constantly seeking to extend the colour range. Felix Jury favoured the perfection of the formal flower and a number of his most successful cultivars fit into this group. However, he was also looking for the attributes of good garden performance with many well formed flowers in open conditions and self grooming. He also loved small flowers and was responsible for creating Itty Bit, one of the first genuine miniature camellias – miniature in flower, leaf and habit. Mark Jury’s selections reflect the changing tastes of the time and he has concentrated more on miniature flowers, compact growth more suited to small modern gardens and top performance as garden plants, rather than show blooms. 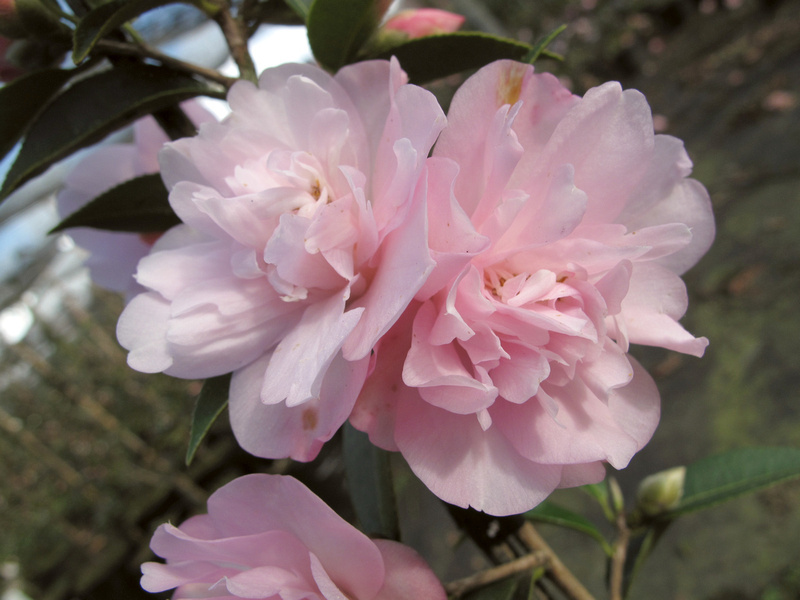 While camellias were the first plant group Mark started hybridising some 25 years ago, with the advent of the dreaded petal blight, he has put camellia breeding on the back burner until the full impact of petal blight in this country is clear. There is almost certainly a future in breeding with plants which are more resistant to petal blight, or with plants which flower either very early in the season or very late – missing the disappointing impact of the fungal flower disease which strikes the middle of the flowering season. There are many camellias in the garden at Tikorangi. 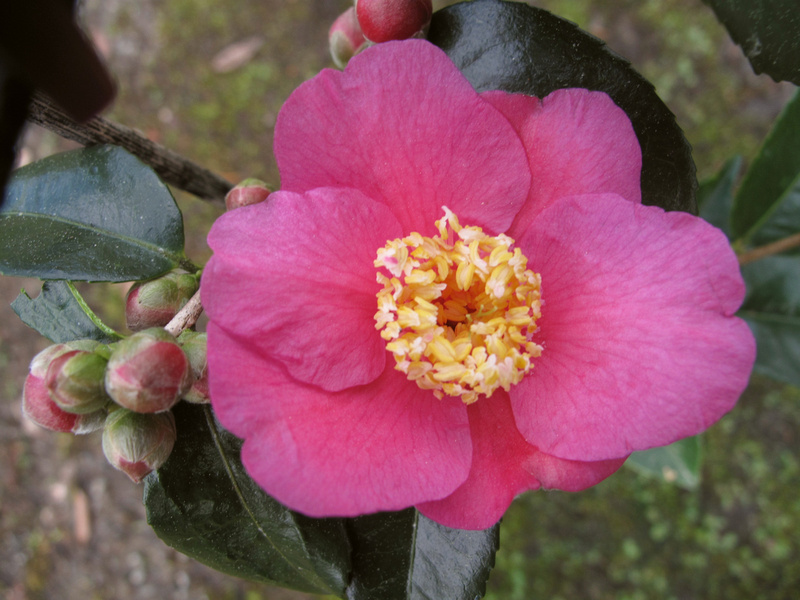 Camellias are a popular and easy plant in New Zealand, tolerating a wide range of conditions. In the garden they are used in many different contexts from roadside shelter in mixed plantings to formal topiaried sets of camellias in pots. In the rose garden and sunken garden area, camellias add winter flowering where they are used as grafted standards, miniatures and clipped feature plants. 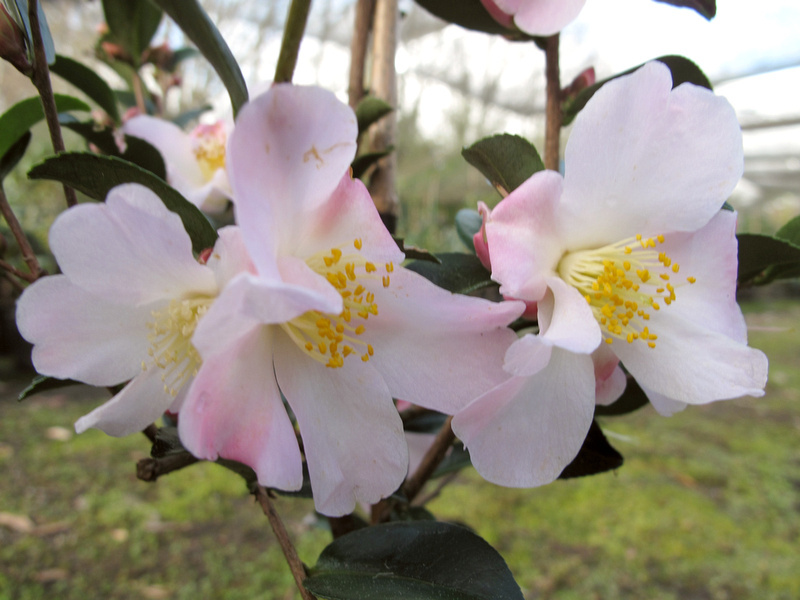 The camellias start flowering in April with the sasanquas and continue through until mid November although the main season is in mid winter to early spring. Mark Jury hybrid, selected for its high health garden performance. Loose peony form in apple blossom pink with sunny golden stamens. Excellent dark glossy foliage on a compact, upright plant. Early-mid season flowering. Apple Blossom Sun : selected for its top performance as a garden plant. Les Jury hybrid. Large peony form, deep rose pink and pink and white respectively. Strong, upright growth. Les Jury hybrid. Lovely formal flower in rose pink with apricot tones. Reasonably weather hardy. Compact, rounded growth. Les Jury hybrid. Creamy white medium semi double. Spreading, bushy plant, almost pendulous. Avalanche (Fantastic x Daintiness) Les Jury hybrid. Creamy white medium semi double. Spreading, bushy plant, almost pendulous. Les Jury hybrid. Frilly anenome form, resembling a ballet tutu, in deep pink or pretty pink and white respectively. Mark Jury hybrid, only ever produced in small numbers as a grafted standard. Forms a pointed head of small leafed foliage with cream flowers (sometimes with pink undertones) which resemble powder puffs, around 7cm across. Dwarf growing and does not require regular clipping to keep its shape. Early flowering carmine pink flower (resmbles the bright pink in highlighter pens) in large peony form. Identical flower in both plants, but Felix’s “Debbie’s Carnation” is a better performer and shows superior growth habit. Strong growing. Classic Felix Jury hybrid. Large formal double in strong lavender pink with distinctive incurved petals. Can be trained to a spreading standard. Felix Jury hybrid. Large flowers in soft pink peony form. Particularly good garden plant well suited to cooler areas. Mid-late flowering. Delightful chance seedling we have raised. Very floriferous, dainty, single, apple blossom miniature blooms, scented. Neat dark green foliage with red stems and masses of red buds. For us flowers from May to October, non stop. Lovely as specimen, column, espaliered or for hedging. Will take full sun. Fairy Blush (lutchuensis open pollinated) Delightful chance seedling we have raised. Very floriferous, dainty, single, apple blossom miniature blooms, scented. Neat dark green foliage with red stems and masses of red buds. For us flowers from May to October, non stop. Lovely as specimen, column, espaliered or for hedging. Will take full sun. Gay Buttons (tinsie x Snowdrop) Mark Jury hybrid. Compact smaller grower with columnar habit which smothers itself in small button flowers in lilac cerise with creamy stamens. Very long flowering season. Felix Jury hybrid. A gem of a plant, a true miniature. Extremely floriferous with miniature lavender pink flowers in anemone form. Ideal for rock gardens, patio, bonsai. Itty Bit (saluenensis x Tiny Princess) Felix Jury hybrid. A gem of a plant, a true miniature. Extremely floriferous with miniature lavender pink flowers in anemone form. Ideal for rock gardens, patio, bonsai. Felix Jury hybrid. Very large rose form to formal double, soft orchid pink. Compact, rounded growth habit. Very freeflowering. Mark Jury hybrid. Large peony flowers in almost luminous pearly white with pale pink undertones. Stamens stay yellow. Prefers some shelter from full sun. Compact upright growth. Mid season flowering. Jury’s Pearl (C. pitardii x Tomorrow) Mark Jury hybrid. Large peony flowers in almost luminous pearly white with pale pink undertones. Stamens stay yellow. Prefers some shelter from full sun. Compact upright growth. Mid season flowering. Les Jury hybrid. White with yellow petaloids in anemone form. Compact, upright growth. One of the early breaks into the yellow tones. Les Jury’s swansong – the best very large deep red informal to formal double he produced in his lifetime. Strong, upright grower. Bred by Felix Jury and one of his finest. Perfect pretty pink formal and more weather hardy than most formals. Named for his wife. Upright growth. Mark Jury hybrid and a curiosity rather than a classic. Compact slow growing bush with an abundance of HUGE semi double soft pink blooms, like an upsidedown ballet tutu. Moon Moth Mark Jury hybrid and a curiosity rather than a classic. Compact slow growing bush with an abundance of HUGE semi double soft pink blooms, like an upsidedown ballet tutu. Mark Jury hybrid, selected for its interesting form and excellent performance even in full sun. Arching to cascading habit, sturdy enough not to need staking, small growing. Very floriferous with pink semi double flowers with fluted shell-like petals. Pearly Cascade Mark Jury hybrid, selected for its interesting form and excellent performance even in full sun. Arching to cascading habit, sturdy enough not to need staking, small growing. Very floriferous with pink semi double flowers with fluted shell-like petals. Les Jury japonica hybrid. Scarlet crimson with showy boss of golden stamens. Semi double flower. Bushy growth. Felix Jury hybrid. 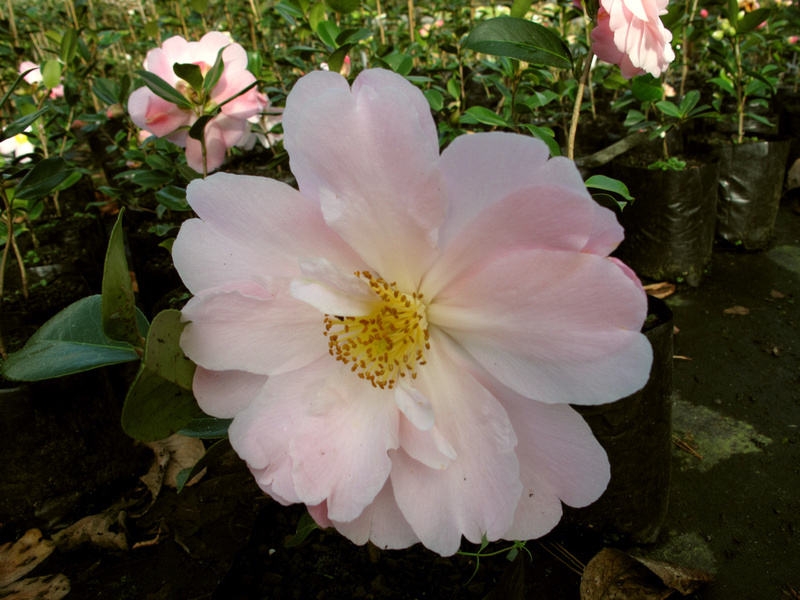 Vigorous plant with large blooms, rose in form and rose in colour. Showy and a show winner. Described by Abbie’s late mother as a substitute for the giant pink herbaceous peony in warmer areas where peonies won’t perform. Felix Jury hybrid and the palest of his formals. Elegant plant and bloom. Creamy rosebud centre with slight suffusion of lavender pink. Remarkably weather hardy for a pale formal. Upright. Mid-late. Topiary Pink (pitardii seedling) Mark Jury hybrid. Small glossy dark leaves on an upright but slow pillar shaped bush, complemented by small formal flowers in lavender pink. Ideal for containers, topiary or even training as formal pillars. Exceptional foliage. This release volunteered itself and seemed appropriate to name for the International Year of Volunteering 2001. Distinctive flowers open soft pink with white edging, deepening throughout the season to dark pink, still with the white edge until the late flowers which may be pure red. Heavy textured full anemone form. Dark foliage and compact growth to 2m. Volunteer (chance seedling) This release volunteered itself and seemed appropriate to name for the International Year of Volunteering 2001. Distinctive flowers open soft pink with white edging, deepening throughout the season to dark pink, still with the white edge until the late flowers which may be pure red. Heavy textured full anemone form. Dark foliage and compact growth to 2m. Felix Jury classic and one of the first named by him. Lavender pink formal double, resembling a waterlily. Vigorous and upright. Other camellias registered include “Pearly Shells” and “South Seas” by Felix Jury and the following by Les Jury: Daintiness, Elegant Beauty, Elsie Jury, Fantastic, Gay Time, Grannie, Joyful Bells, Jubilation, Juliet Spencer, Jury’s Charity, Jury’s Sunglow, Kia Ora, Lady Cutler, Mona Jury, My Diane, Opal Princess, Pacific Beauty, Parisienne, Polyanna, Ruby Wedding, Salamander, Satin Gown, Senorita, Sir Victor Davies, Treasure Trove, Twinkle Star, Villes Delight, and Wilber Foss. This list of Les Jury’s registered hybrids is incomplete.